Last month, I held a briefing on drone strikes, a cold-blooded military euphemism for a method of waging war that is more properly described as "remote killing." Last year, a mindless killing machine - an American drone aircraft - killed an innocent grandmother as she was harvesting okra outside of the family's home. My friend, the filmmaker Robert Greenwald, brought her family's compelling story to my attention, and I helped to bring them to the attention of Congress and the nation. 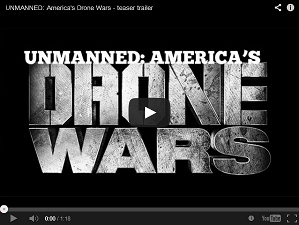 Robert Greenwald recently released a new documentary with their sad story, and others like it, called Unmanned: America's Drone Wars. I've seen it, and you should too. It's an incredible indictment of remote-controlled death from the skies. Watch the preview and sign up to get the Livestream link -- FREE! "If you agree with me that, due to the extrajudicial nature of these killings, they should stop, then I welcome you. If you agree with me that, due to the belief that collateral damage in the form of the death of innocent people, an adult or a child, should never be acceptable, particularly at the will of one man, then I welcome you. If you agree with me that the unintended consequence of civilian deaths attributable to drone strikes, and the public opinion that has mobilized against this in every nation that has been victimized by drone strikes, ultimately engenders more hatred toward America than it could possibly extinguish through death, then I welcome you. And if you have yet to make up your mind about the pros and cons of these drone strikes, these miniature acts of war, then I am particularly glad that you're here this morning, or that you're listening from near or far. "I can think of no better person to shepherd us through the intricacies of drone use abroad than this person who I am proud to call my friend, Robert Greenwald. And as you see, he has a new documentary called 'Unmanned: America's Drone Wars' coming out, that will be essential viewing for every American with a conscience. I urge everyone to see the full documentary and ask the pressing questions that will come to mind." Now, you can see a preview of the documentary and sign up for the free Livestream. Do it. To learn the truth. Watch it. And then pass it on to your friends and family. Because it's time that this secret war is no longer a secret. Together, a few months ago, we lovers of peace stopped a war with Syria. Maybe, just maybe, we can stop remote killings too. Thanks for all you have done, will do, and can do. Blessed are the peacemakers. P.S. If you're going to share one thing on Facebook or Twitter this year, this documentary ought to be it. Share it with your friends, your family, your co-workers, and your neighbors. Share it with the world. Because if we have any hope of ending this, then the world needs to know.